Puppies had a wonderful time meeting with the 5 families that came by this past weekend to visit. On Sunday two of their families stopped by and spent some time getting to know them. Both families picked their two favorites and left here happy and full of puppy love. On Monday two puppy families came to meet the pups and one family that just wanted to meet me and my dogs stopped by. We had families scheduled every hour 12, 1 and 2, but somehow we ended up at one point with all 3 families still here. LOL... I really enjoy the time I spend with the families getting to know them and them getting to know us all. The children were all so amazing and well spoken. I cannot wait for them to each get their new baby home and start the bonding process. We now have 4 pups available. 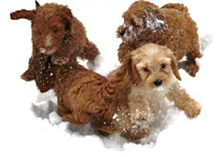 4 families have decided to wait until Spring for a puppy due to travel and changes in schedules. Give me a call if you are interested in one of these beautiful minis or small mediums.